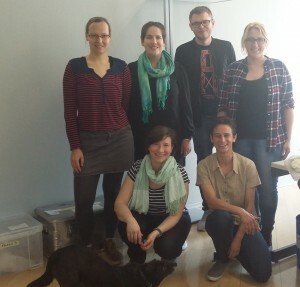 With April 2016, the second year of AcrossBorders with the LMU Munich as host institution has started! Having just returned from fieldwork and our various home bases, we are all very happy about the new location of AcrossBorders’ office. After almost one year struggling with a “temporary solution”, we are now located in the centre of Munich, within a range of less than 1 km to the Institute of Egyptology and the Egyptian Museum, thus very close to relevant libraries and our colleagues. Life and work should now be much easier – insha’allah! I am also delighted that Meg Gundlach, our registrar since 2015, has now officially joined AcrossBorders as PostDOC team member. She will concentrate on the analysis and publication of the small finds from our excavations at Sai and Elephantine. Luckily, there’s currently perfect spring weather – thus a very warm welcome to Meg in every respect: Servus in Minga und herzlich willkommen im Team!